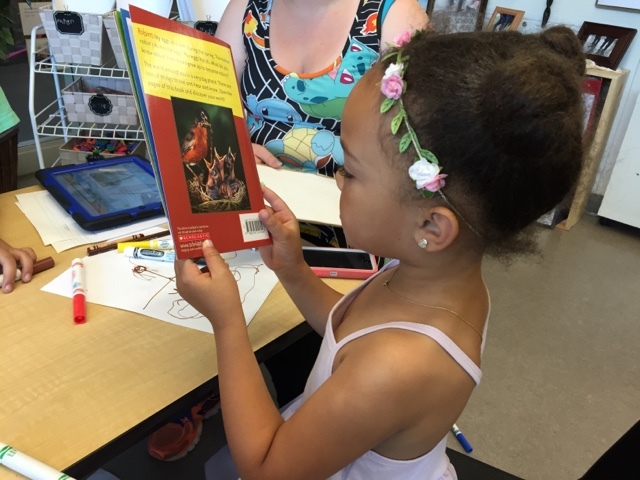 "Emergent curriculum allows teachers to collaborate with children around their ideas, questions, development, and topics of interest. 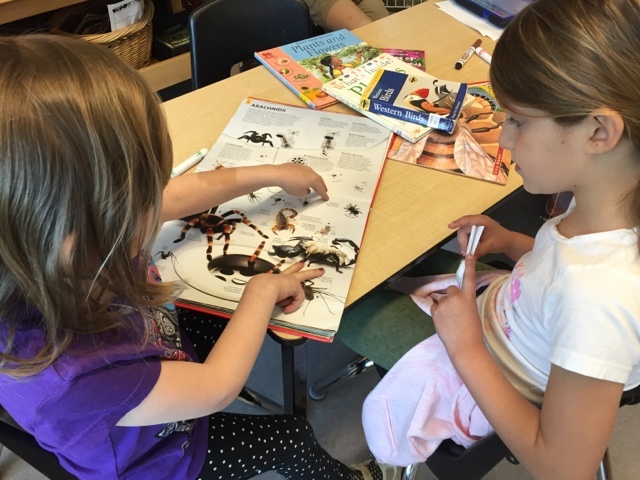 It is a continuous cycle that requires teachers to observe children and to listen closely for their ideas. 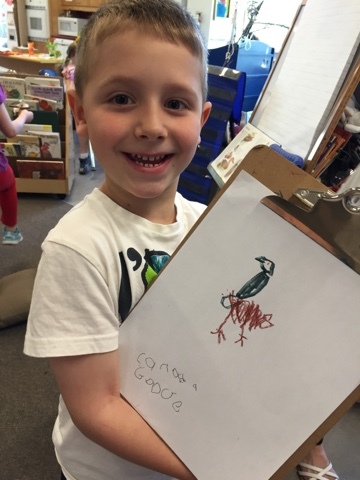 Observation and listening are followed by the teacher's thoughtful response, which builds on what the children are doing and thinking." We are really fortunate to have a big, beautiful school yard that the children enjoy playing in. 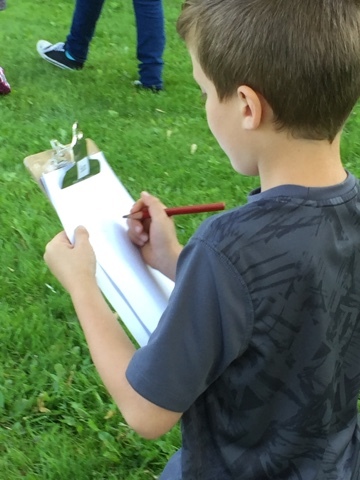 We have at least one hour each day in our 'outdoor classroom' so the children can experience the joys and wonder of nature in both structured and unstructured activities. As spring marches forward we have been spending much time outside. 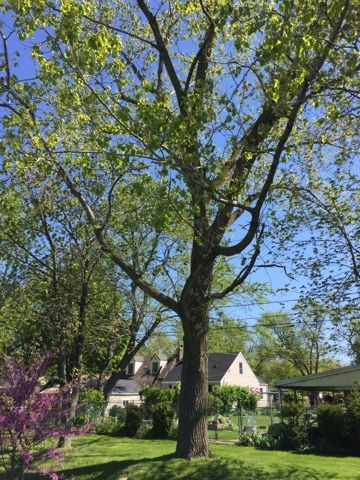 The trees in our yard are strong and tall; we call our students 'the little acorns that will grow into mighty oaks' because of the beauty and diversity of life in our yard and because we want to emphasize the eco-nature of our school. 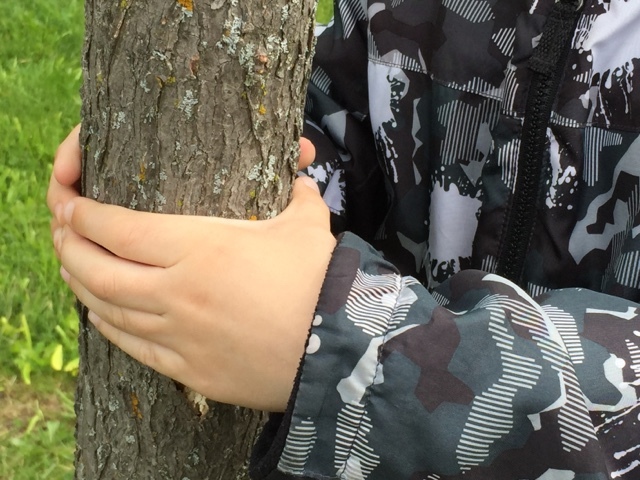 Last week the children were drawn to one tree in particular. 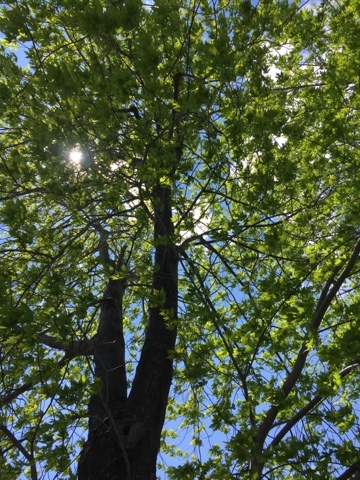 This tree towers over the others and has brilliant green leaves. When you stand under it you feel enclosed in a safe place and can appreciate the sun streaming its rays through the foliage. 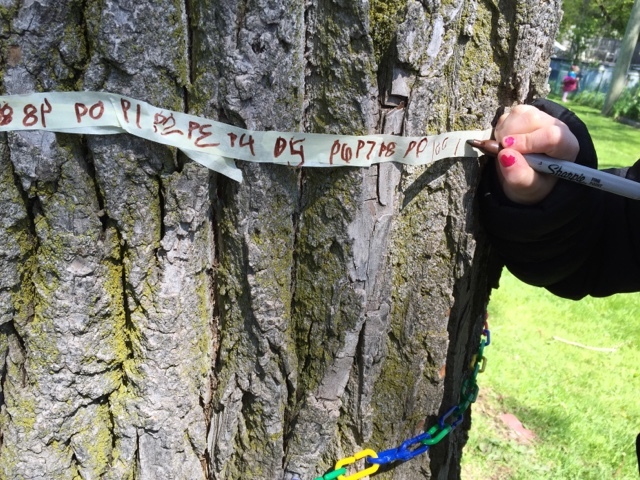 ...the children keep returning back to this one tree. 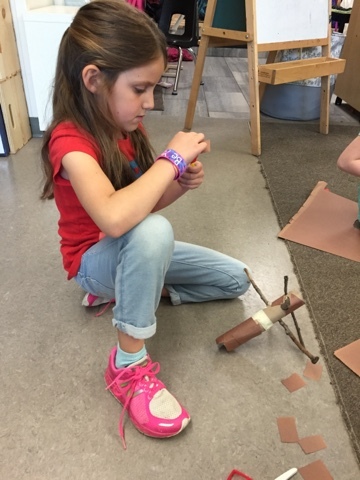 I've been asked by a number of teachers recently about how we encourage such robust, deep thinking regarding math in our classroom and how we negotiate a balance between teacher guided and child led activities. Do we explicitly teach concepts to children? Do we engage them in whole group circle time lessons and discussions? Do we use complex tools and terminology even if we are unsure that all of the children in the group are interested in the topic? 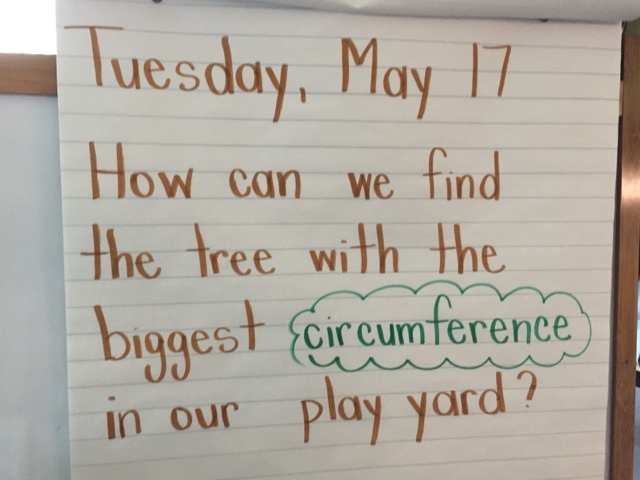 The answer to these questions is yes, and I'm hoping that by sharing our current tree inquiry our process will be transparent so others might be inspired to engage their kindergarten children in robust, low floor high ceiling math tasks. 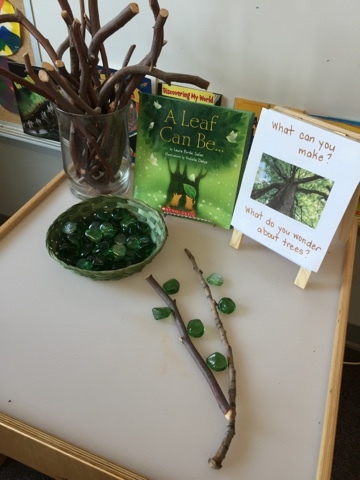 Wanting to encourage the children to think more deeply about the physical structure and beauty of trees we placed some interesting loose parts on the light table along with a book we've read together (A Leaf Can Be by Salas and Dabija) and a photo of our tree. Each morning after our first open play block (the children enter our classroom, put their personal belongings away, sign in and then have an open play block for approximately 40 minutes) we have an opening circle that all children attend. During this time we share news, read a morning message, and discuss some of the new materials that have been placed in the room. 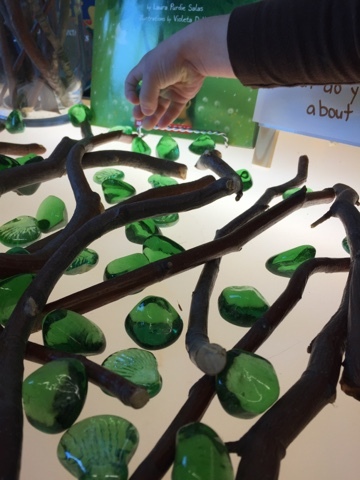 Today we reminded children of their interest in the trees by reviewing pictures of their play and explorations from Friday, and introduced the new loose parts available at the light table. We asked the children for suggestions for what the materials might be used for, and invited those children who visited the area to share their ideas with us during the play block. 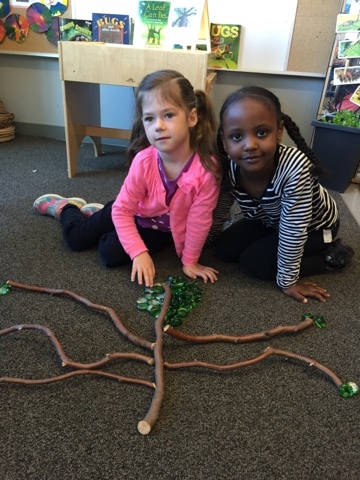 Many children were quite eager to explore the materials today and represented their interpretations of the tree in interesting ways. 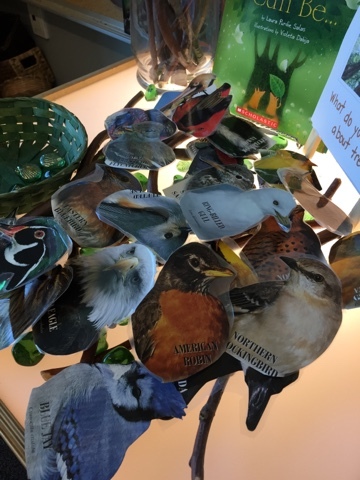 Some friends felt that their tree needed birds and incorporated materials from other centres. 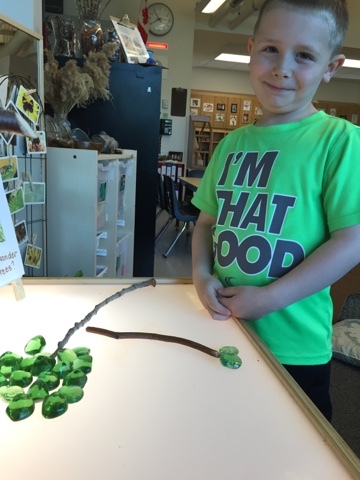 During the play we noticed and named the math that emerged including the interesting sorting of the green gems together with the involved children. We discussed sorting rules, symmetry, and length. After our second play block we have a sharing circle where children can volunteer to discuss their ideas and experiences from play. Today we showed the children digital pictures of the loose parts creations and engaged them in a discussion about the math they noticed. 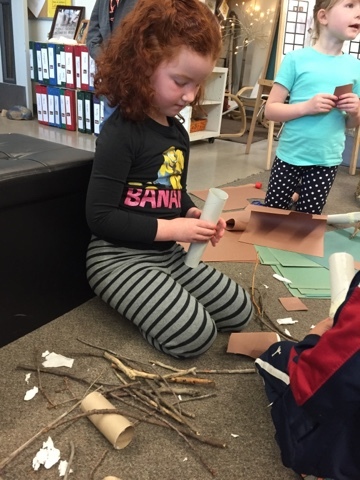 We explicitly named the sorting, symmetry, and measurement and asked for the children ideas regarding what they knew about these concepts, what they have done in the room similar to these, and where they might go next in their work. Many children were quite interested in the pictures and this sparked additional interest in the centre later on in the day with more children visiting. 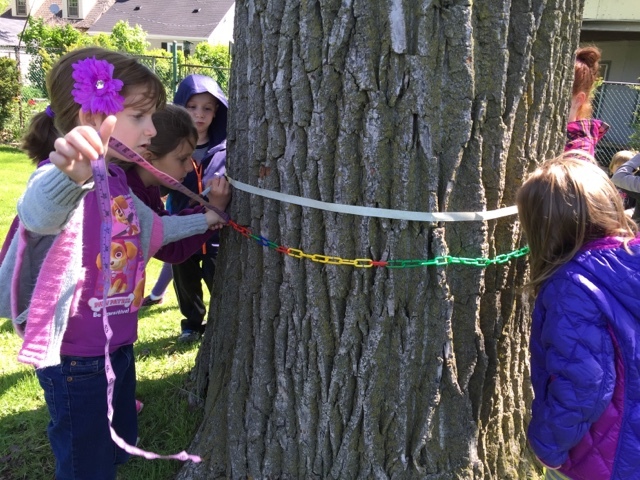 During our outdoor exploration we invited the children as a group to visit the large tree that had captured their attention and engage in some mindful observation and drawing. 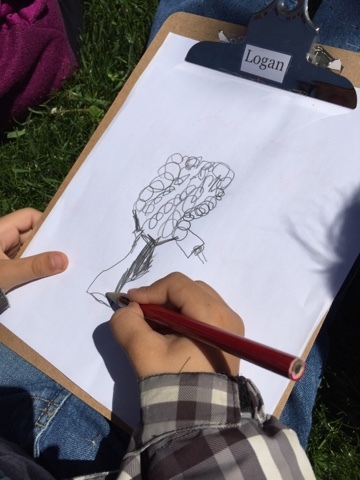 Each child used their drawing/writing clipboard to carefully sketch the tree. 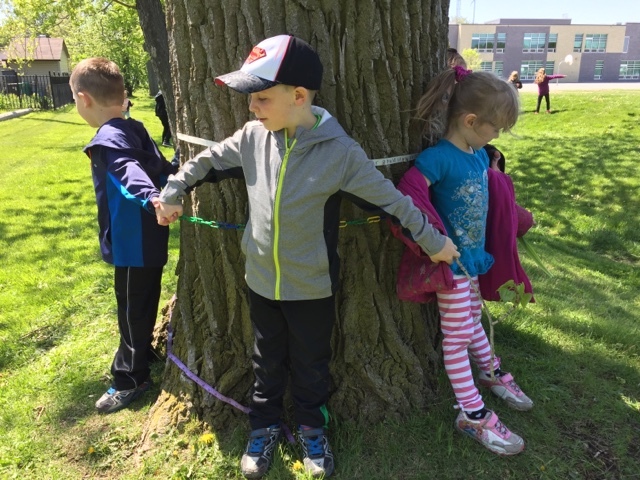 Although every child was asked to participate, when they were finished they were encouraged to move onto another outdoor play activity of their choice. 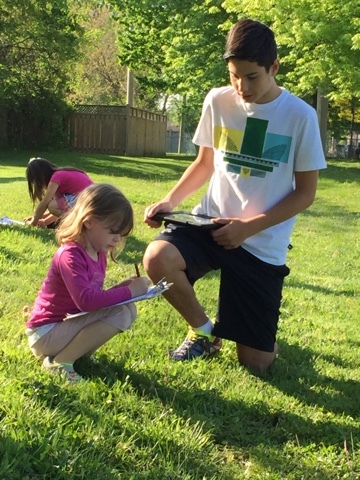 One of the educators remained with the children who wanted more time to sketch. 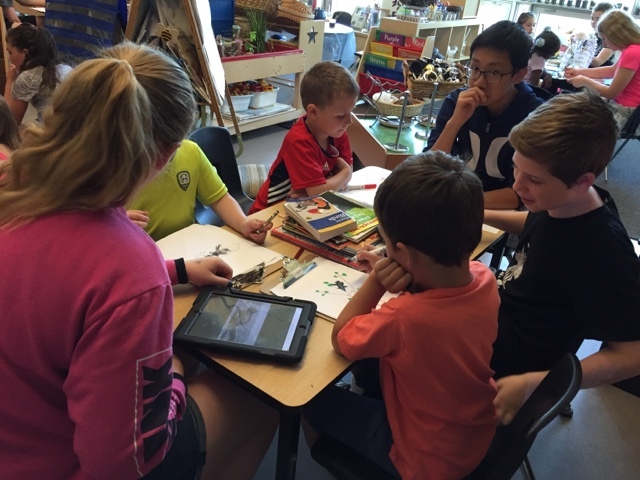 Throughout the year we have engaged children in many still life art activities. We believe that drawing is a language that children use to express their ideas and theories about life and the world around them. Drawing the tree might inspire them to consider just how big the tree was, and spark additional questions and ideas about our play yard. We felt this was important for all children to experience, and it also ensured that each had engaged in daily writing/drawing today. 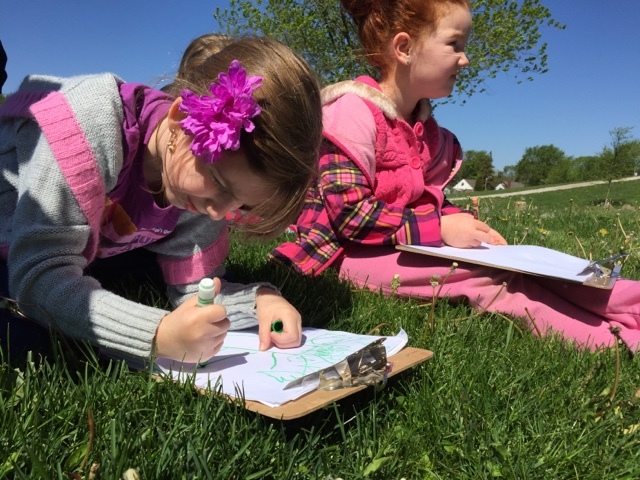 Outdoor drawing is a quiet and reflective experience as children mindfully work on best representing their ideas in their chosen medium. 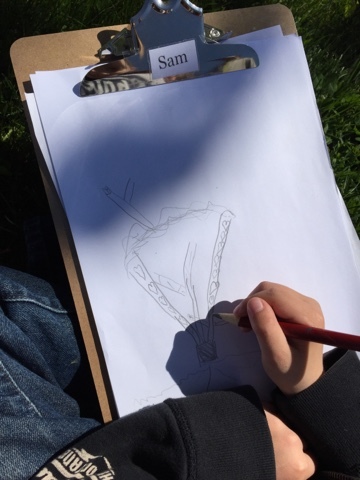 Most children chose to use pencil to sketch today. 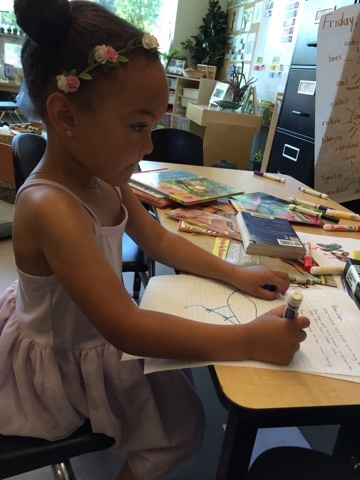 Visitors to our room often notice the skill and careful attention our children use in the arts. We know it's practice, patience and perseverance that cultivates the observation and commitment to detail within the art form. We communicate through the language of art on a very regular basis. 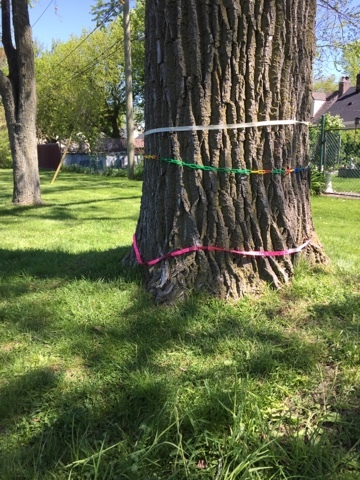 After drawing some children wondered just how big around the tree actually was. We asked them how they might find out. 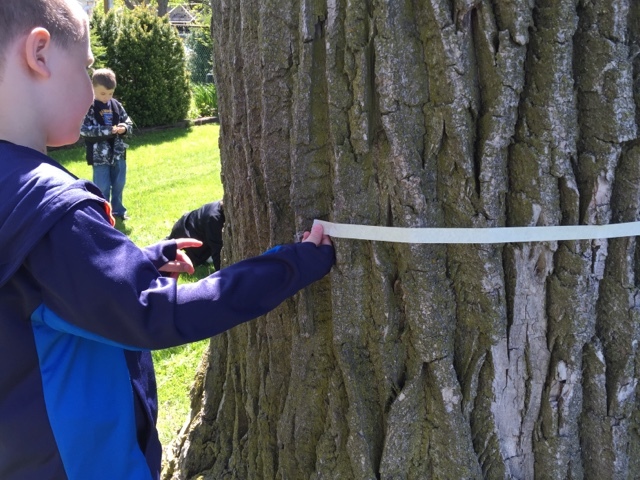 The children had some really interesting ideas for how to measure this big tree. First they thought wrapping masking tape around the trunk would be effective. 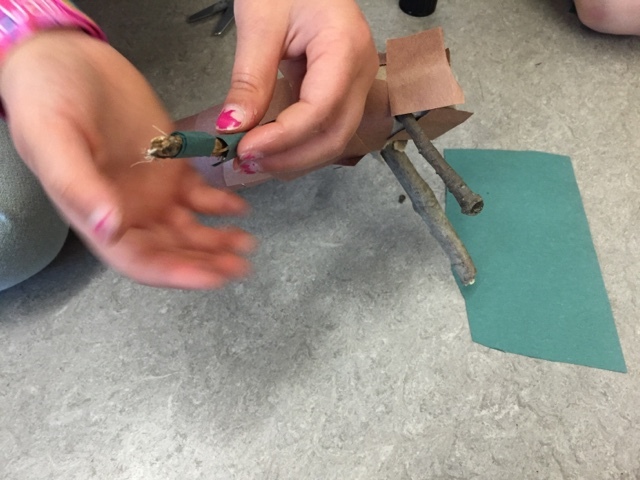 Some children wanted to standardize this tool and quantify it so they worked together to write numbers on the tape. According to their measurements the tree was 140 around. 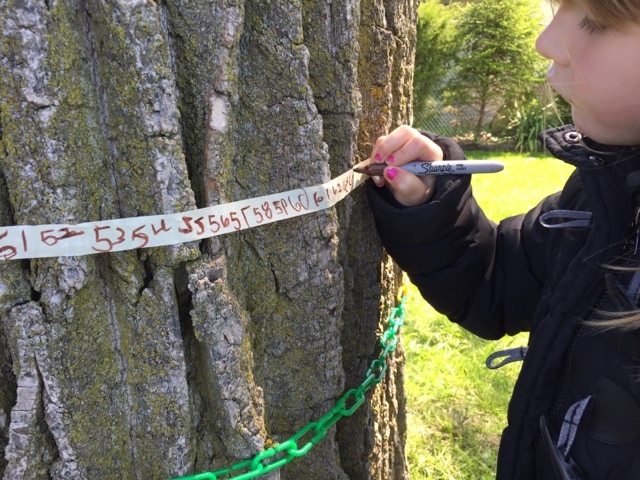 This inspired another child to measure a neighbouring tree in the same way! The focus and dedication needed for this task is most impressive! 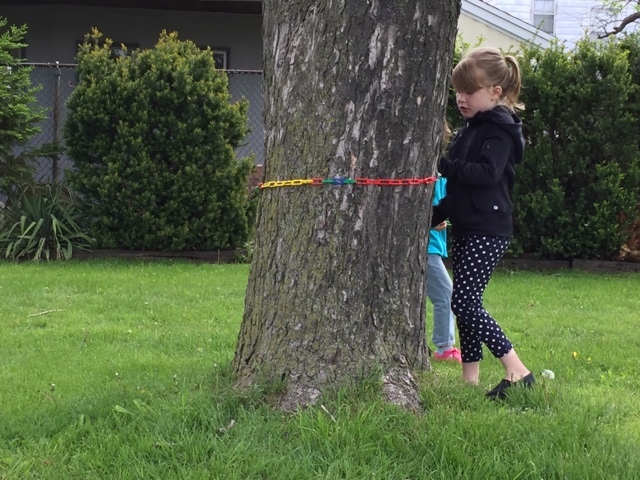 A group of other children decided to use links to see how long around the trunk was. 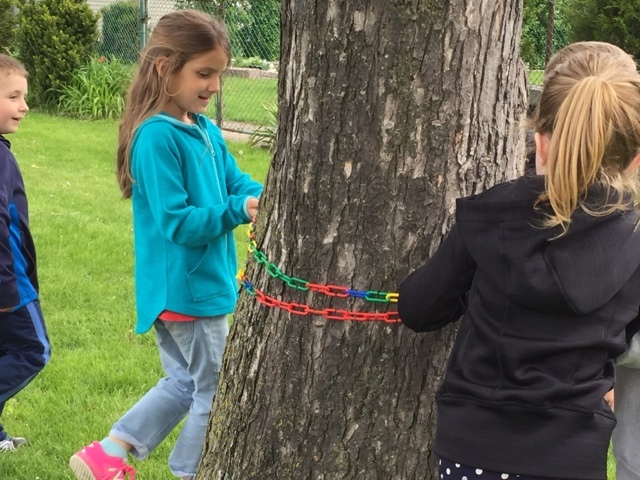 They got to work connecting links and worked together to tightly wrap the chain around the trunk. A few other children wanted to use measuring tape. One wasn't long enough so they problem solved by taping two together. We discovered that the tapes totaled 300 centimetres long! Once each strategy for measuring was used we discussed which seemed easiest and most effective. We introduced the term 'circumference' to the children. At this point in the afternoon there was a small group of dedicated children working on the measuring; uninterested children had moved on to other outdoor play activities. 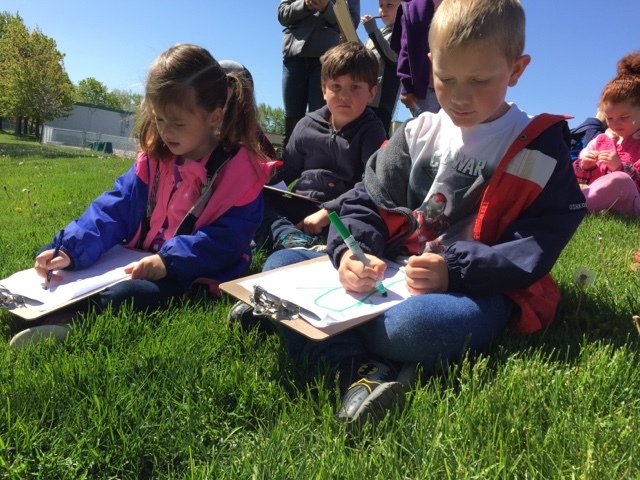 We consider this a small grouping of children working on a dedicated exploration. At some point other children became interested again and wanted to see how many children it took to go around the tree. It took five children to measure around! 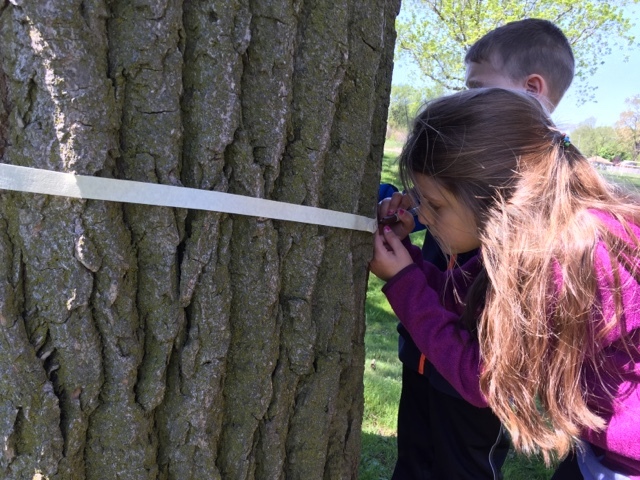 After the children had measured the tree in the many different ways, most moved on to other activities. During the next whole group discussion we brought documentation from the measuring experience (photos, videos, the actually links/tape/measuring tapes) to our whole group circle for all children to observe and discuss. 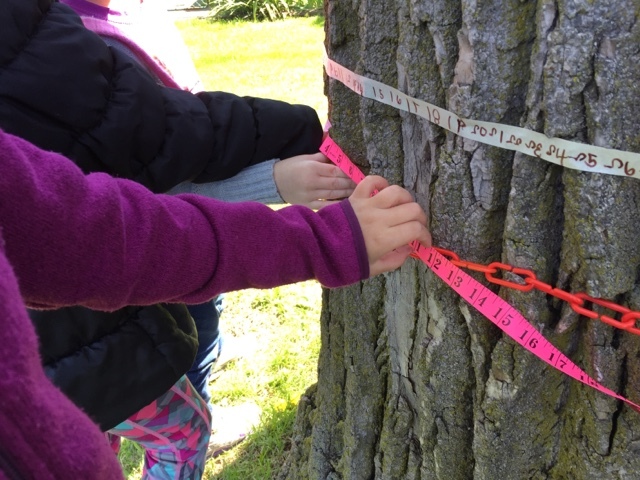 We wanted to engage all children in a discussion about measurement, introduce the word 'circumference' and ask them for any other ideas they might have for how to measure the big tree. 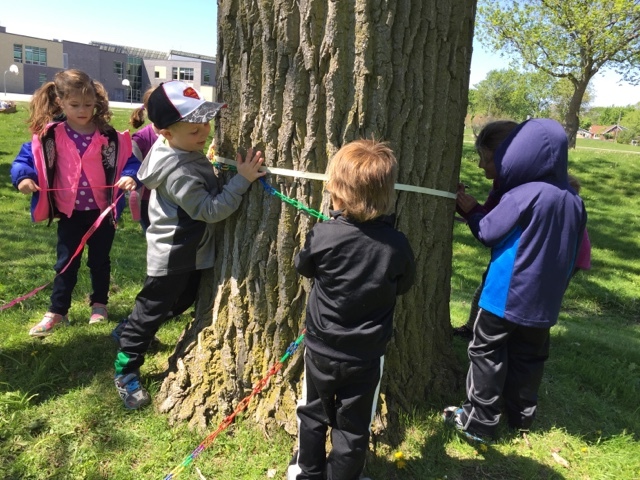 This sparked additional interest in the trees in the yard, and our plan became to challenge the children to explore the play yard again and see if they might locate a tree with a bigger circumference than the one we have already measured. 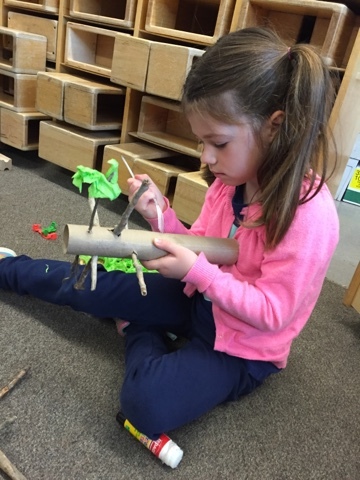 As the reflexive educators in the space we are attempting to heighten the explorations by building upon the children's prior knowledge and seeing if they can apply and extend their ideas in a new and more difficult experience. The next day we introduced a fiction book to the class that involved some of our favourite characters. 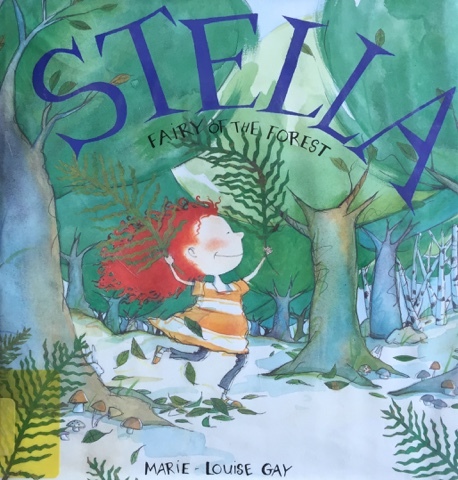 In 'Stella Fairy of the Forest' Stella, Sam and Fred explore a treed area and discuss all the wonderful things that might live there, including fairies. On one page Stella points out how big and old the trees in the forest are. 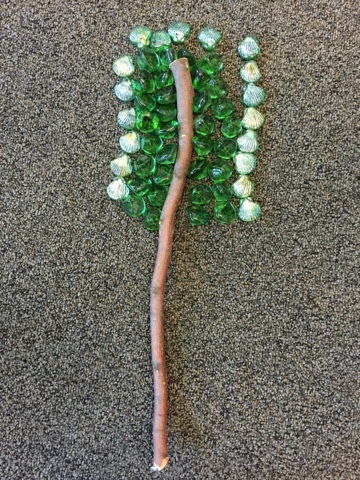 At this point we engaged the children in a text-to-group (self) connection and asked them to reflect upon the similarities between our yard and Stella's forest. 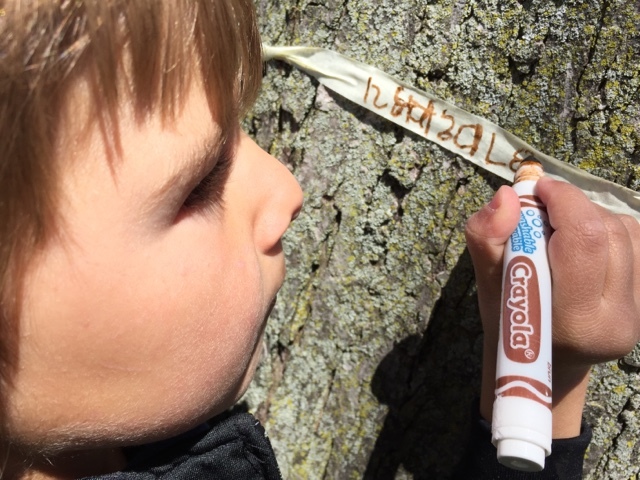 The children made the connection that we also have big trees and that must mean they are old. We discussed our challenge from morning message and wondered how we might go about finding the biggest (and maybe oldest) tree in the yard. 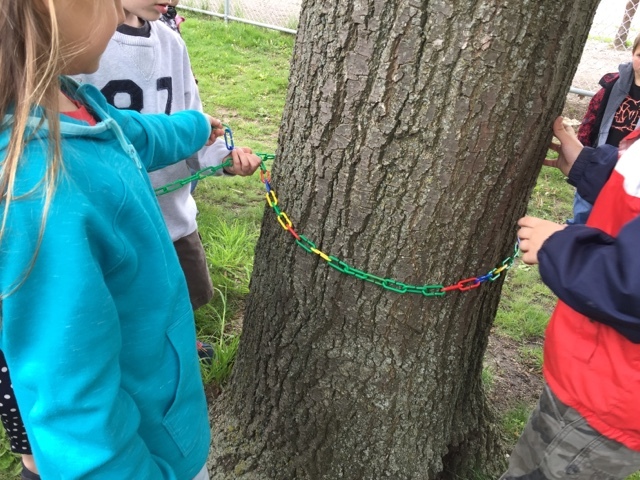 The children suggested using the chain of links to see if there are bigger trees. "If we wrap it around another tree and it's too small, that means the tree is bigger than our tree." During playtime many children were captivated by the ideas of fairies and decided to turn our sensory table into a forest playscape. They problem solved with some of the recycled materials that have been donated to the program and worked diligently to craft their own trees to be included in the 'forest'. This was a multi-step process and involved extensive planning and building to get the trees to stand and look just right. 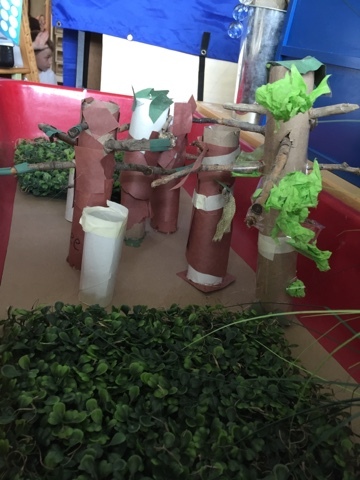 This is what our magical forest looks like and our next step will be to design and create our own fairies in the art studio tomorrow. 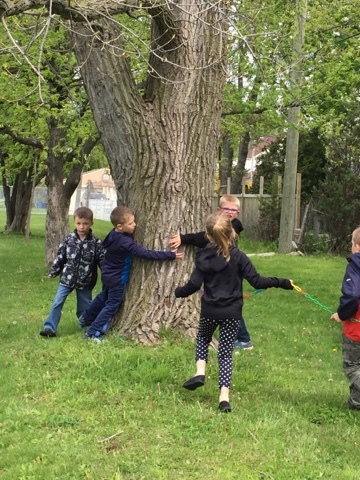 During outdoor play time many children were eager to bring the links outside and discover if there was a bigger tree in the yard. 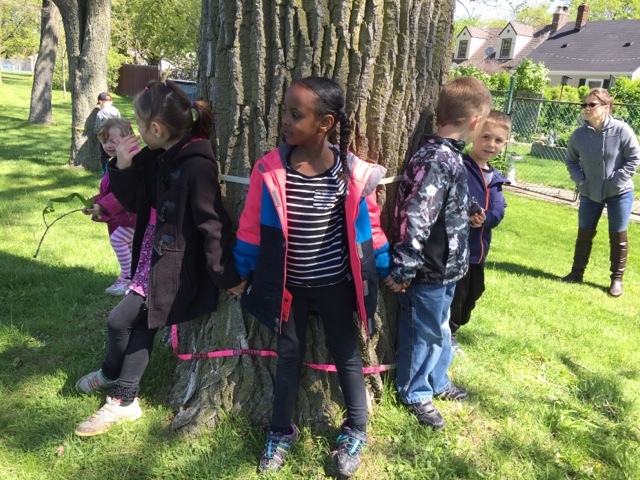 We started at one end and moved from tree to tree, holding up the link and comparing whether or not the tree was bigger. 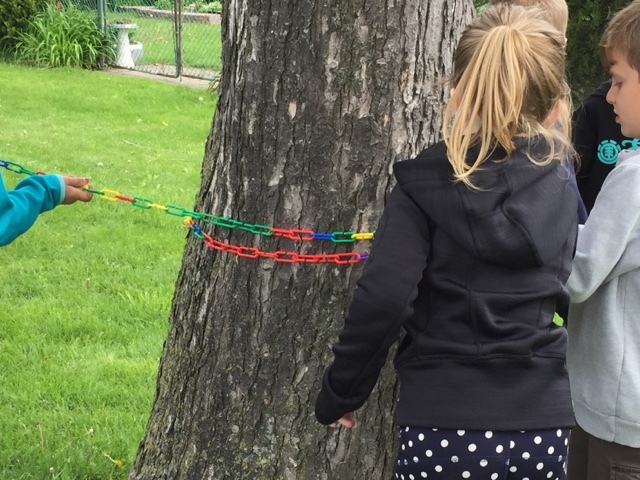 This was a rich opportunity full of math language and connection as the children mentally compared size and worked together to manipulate the long chain in an efficient and meaningful way. 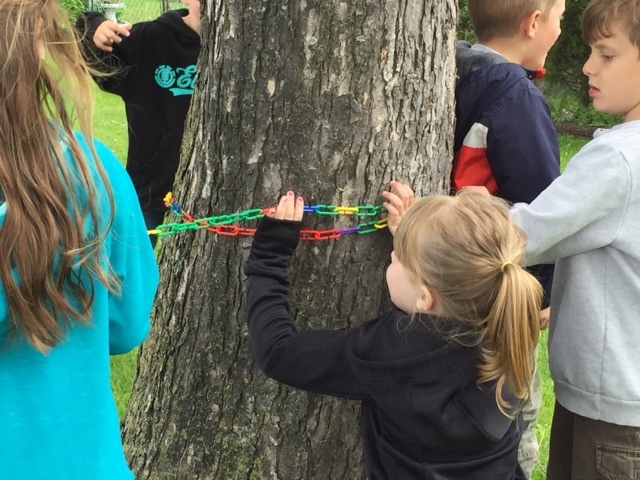 They knew that an overlapping meant the tree was smaller and that they needed to be looking for gaps in the ends of the chain where the ends could not meet. Some friends remembered that the big tree required many children to stand around it and hold hands. 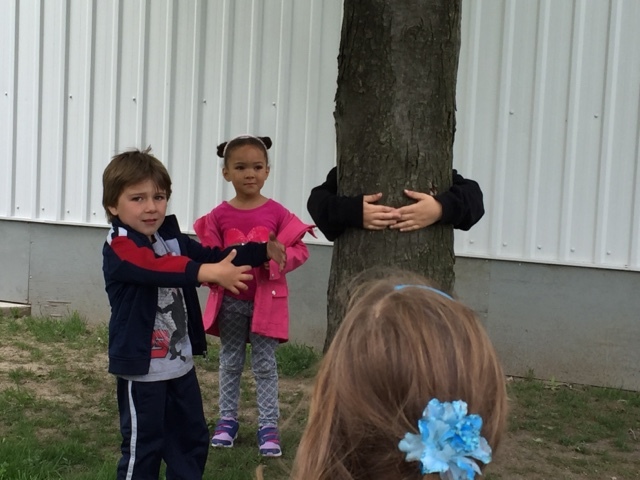 They used their own arms to see if trees were bigger or smaller. 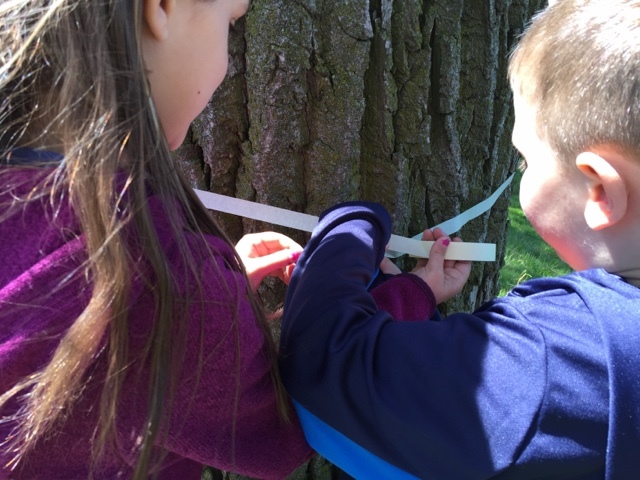 It was interesting to see how quickly the children could compare similar trees and bypass them without measuring because they just knew the tree was smaller than the big one. They were become efficient in the task. Finally we found a tree that the chain could not fit around! Walking back to the classroom I overheard an interesting exchange happen between two children. "The new tree is bigger, but I wonder just how old it is!" "We could cut it down. If you look inside a tree you can see how old it is." "Count the number of circles inside." "But then the tree will be dead. If it's dead, no one can see it again. It won't be in our yard anymore." "I don't know how to figure it out then." 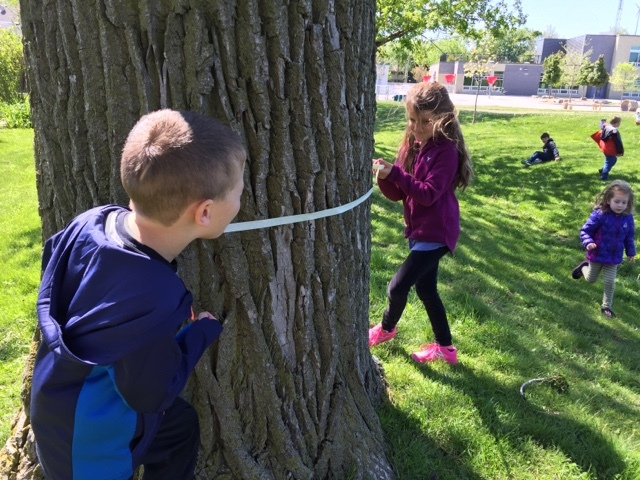 And with that one statement, our inquiry sparked forward and we wondered how to engage the children in continued explorations about the age of the tree and the preservation of our beautiful nature reserve. We decided to include a question in our morning message to provoke some discussion in this area. 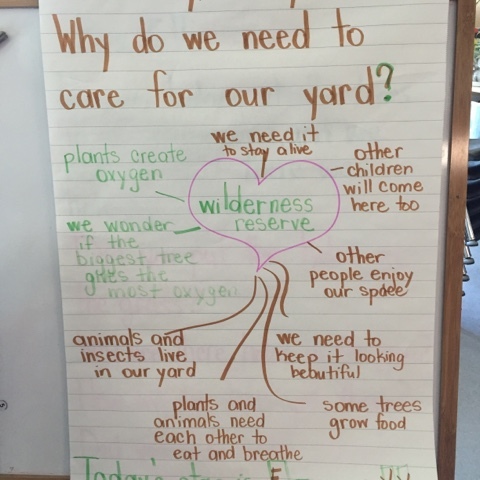 We asked "Why do we need to care for our yard?" The children were quite interested in the question and had many different ideas regarding why. We tried to capture their thinking in the fast paced discussion (which can sometimes be challenging when many in the group are interested in what is being discussed). 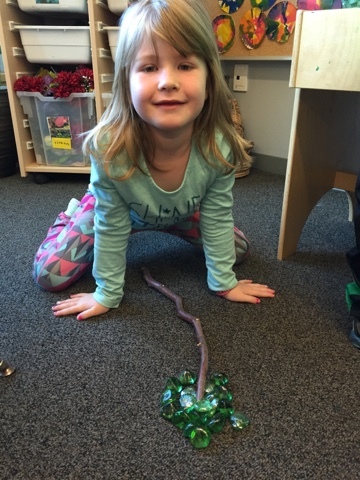 "We have a lot of plants. Plants make clean air for us." "No, plants don't make clean air...plants make oxygen...not air!" "We need air to breathe!" "Plants and animals need each other to eat and breathe. We need it too to stay alive." "Do you think the biggest tree gives the most oxygen?" 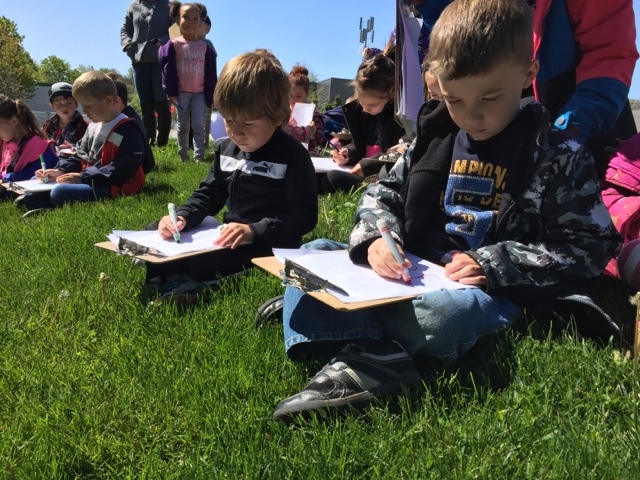 "Our yard is special because animals and insects live in our yard." "Some trees grow food for us too!" "We need to keep it looking beautiful!" "Other children will come here too one day." 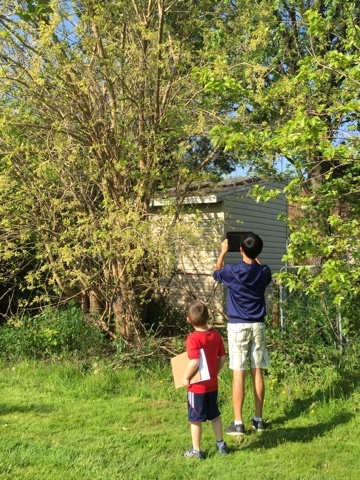 As an educator I found the discussion incredibly exciting and interesting; the children appeared to have a solid understanding of why taking care of nature (our yard) was important and were highly interested and engaged in the conversation. 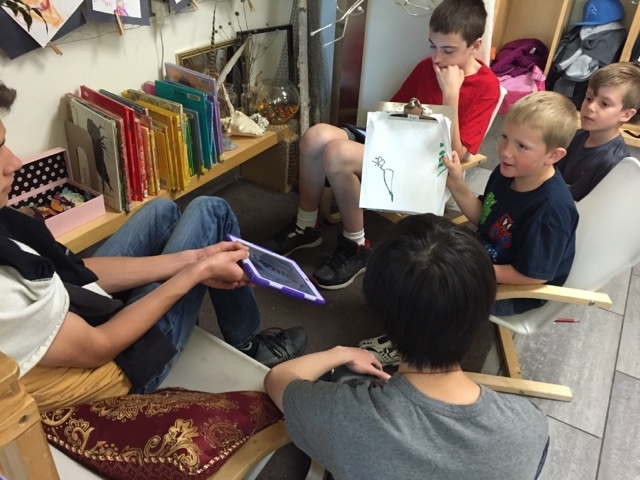 They respectfully took turns sharing their ideas and actively listening to their peers. I knew that this was a topic that was of great interest to them. 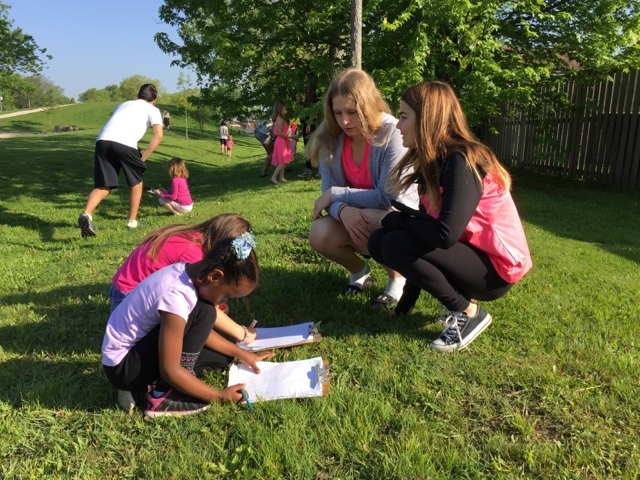 I was captivated by the idea that the children felt the yard was important to care for so others in our community and future students could enjoy it too. 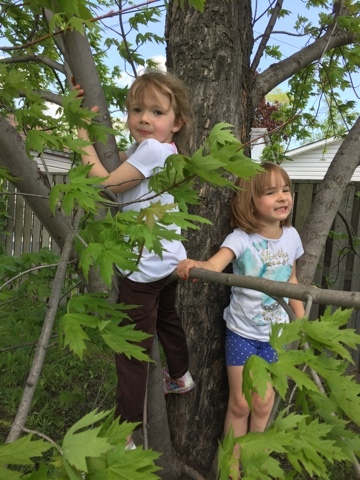 We spend at least one hour each day in our outdoor space and the children had become quite familiar with the living things and nuances of the yard. They loved exploring the hill, the dry riverbeds, the prickly bushes and the treed spots. I suggested that the next time we head outside the children pay careful attention to the things they really felt were important in our wilderness reserve...things that others would want to know more about and take care around. At this point in our inquiry we have been working to document our learning together with the children. 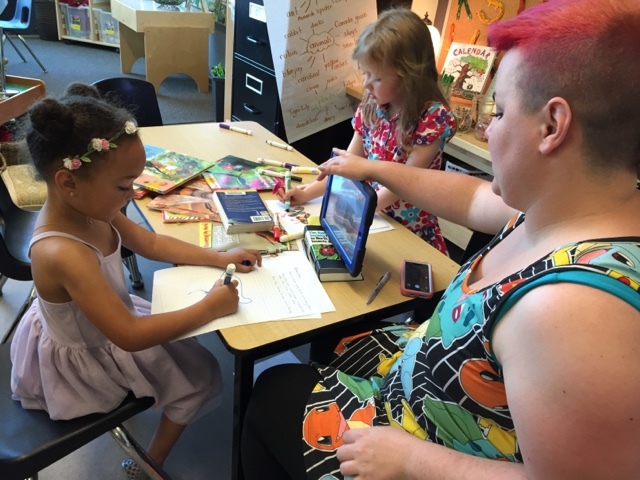 We like to use digital forms of recording photos, videos, student voice along with teacher observations and interpretations. These are merged together in an aesthetic document (I like Pages) and displayed together to tell the story of what has happened. When reading the panels from left to right, they tell the entire story of the inquiry to date. 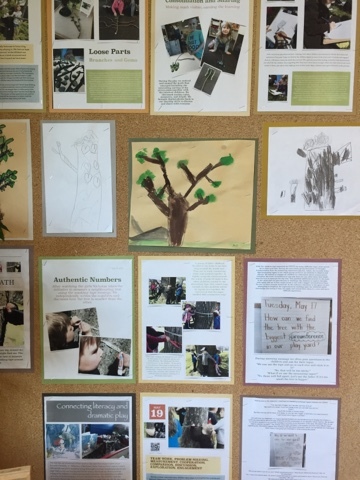 Student work is woven within and also posted in the photos on each page. Each page is also written as an independent page so that a certain event or activity in the inquiry can be explored by itself. When the inquiry concludes we will take all pages and student artifacts down and assemble them in an inquiry binder for safekeeping and future reference. 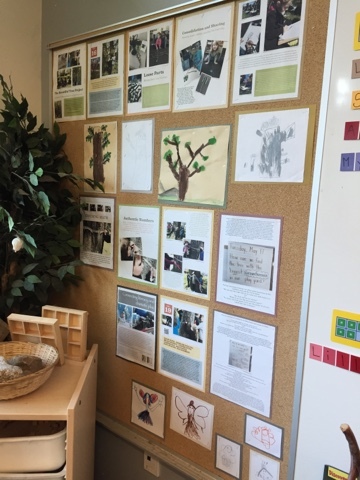 We also will include any other artifacts of learning and insert our inquiry planning pages to help show how the curriculum was fulfilled. We are fortunate to have the support of our families. 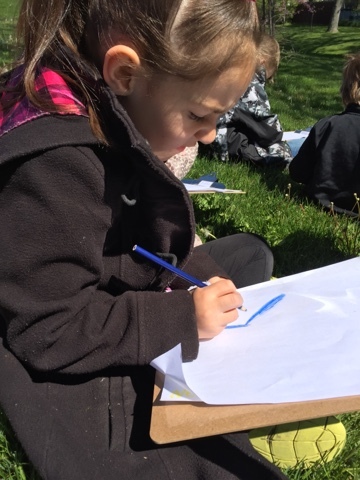 On May 20 Miss Nadine joined us to help support our initial research into learning more about the plants, insects and animals that live in our wilderness reserve. 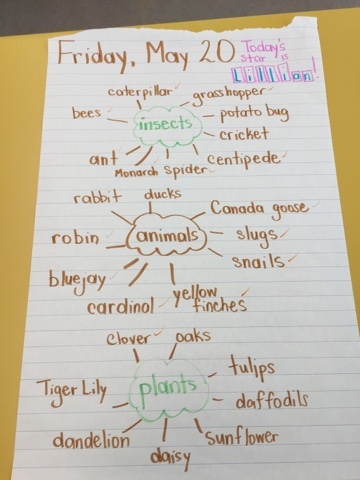 After brainstorming an initial list, Miss Nadine used a variety of information sources to help the children learn more about specific living things. Each child either read (or was read) information and helped Miss Nadine isolate the important information. 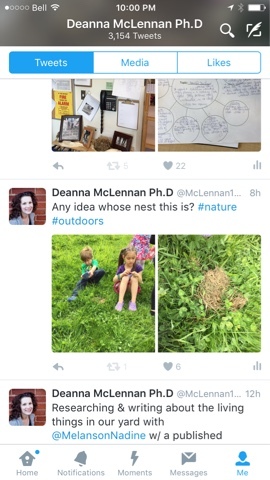 They also added in their own observations from prior experiences seeing that living thing in our yard. 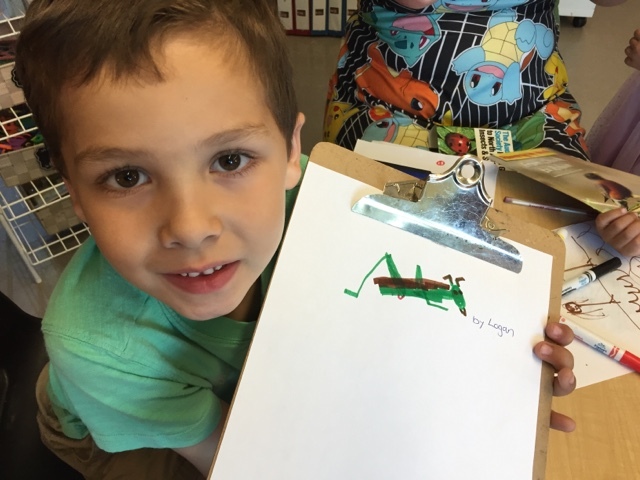 Each child who visited the centre also drew a picture of their living thing. 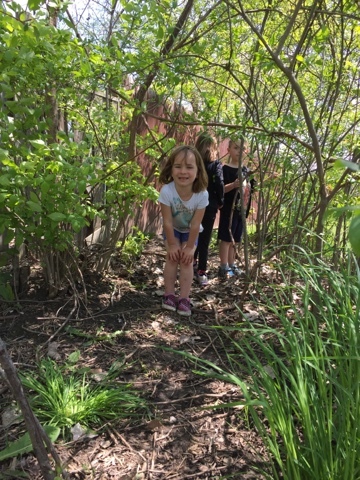 We have also noticed the children taking special interest in continuing to look for living things and creepy crawlies in our yard during outside time. 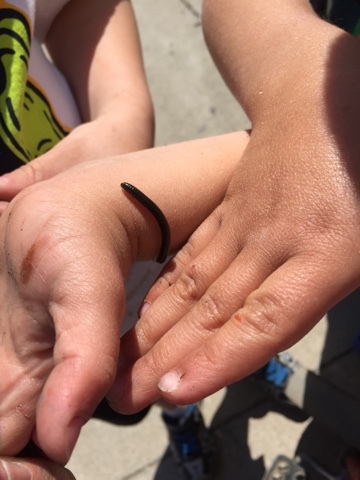 Today they found a millipede and it was interesting to listen to their conversation and how their discussions have evolved with our new focus on the yard. "Look! Look! What is this?" "No, centipedes have long hairy legs. That's a millipede. Millipedes are cool!" "Be careful with it! Don't let it fall from your hand!" "I want a turn, give him to me." "If I give him to you, you need to be careful." "We need to take care of him and make sure he doesn't get hurt." "I think we should put him back with nature where he belongs." 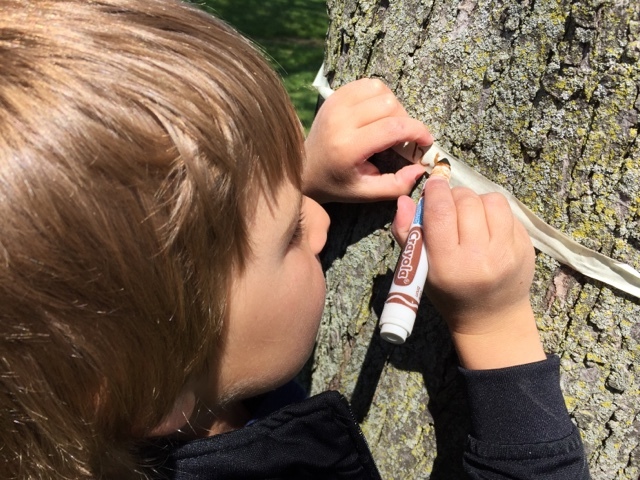 It's clear from the children's conversations that they are aware of how to carefully handle items from nature in a respectful way. They are eager and excited to explore what might have once been frightening, and are working together to ensure everyone has access to the experience. 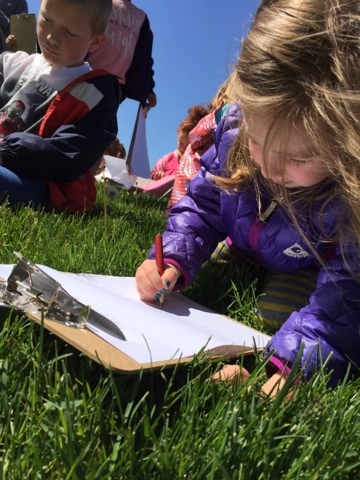 Would these conversations had been as rich if we had not followed the children's lead and interest in exploring the outdoor space? This was also evident in their outdoor play. 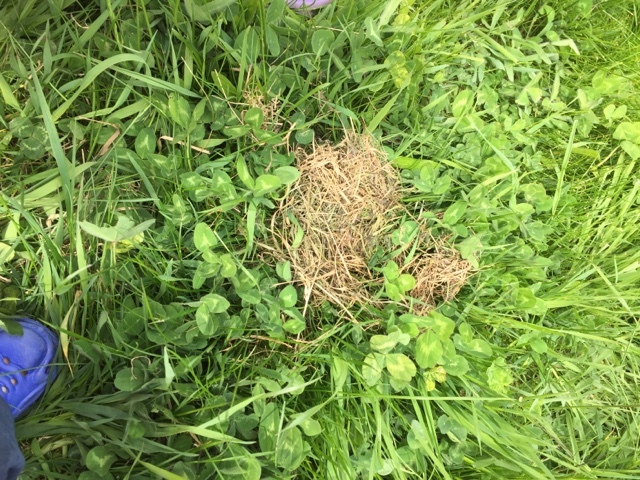 The children noticed what they thought was a nest tucked in the grass on Friday afternoon. The mysterious collection of dried grass caused quite an interest in children and they debated who made it. "It's a rabbit hole! There are babies in there!" "No, it's a snake hole!" "I think it's for a bird." "How should we find out what it is?" "Let's tweet the photo and see what other people think." 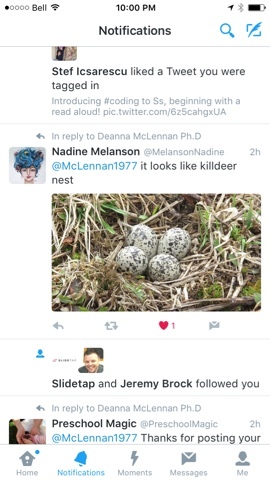 One of our children's mothers responded with the answer! 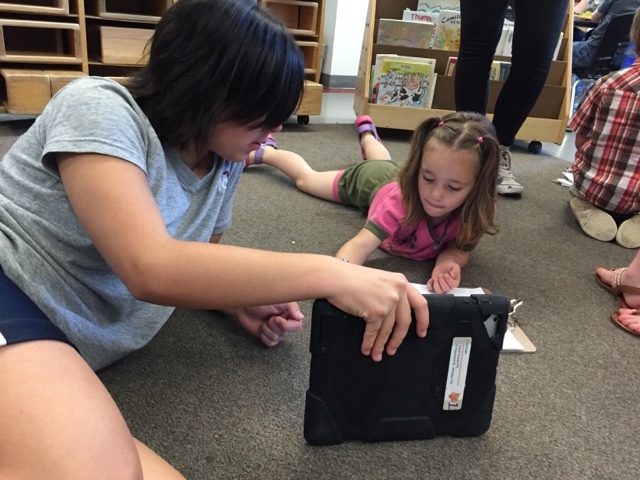 Technology was effectively used as a research tool within the moment of learning and we had now gathered more information to add to our research and writing about the Dr. David Suzuki P.S. Wilderness Reserve! 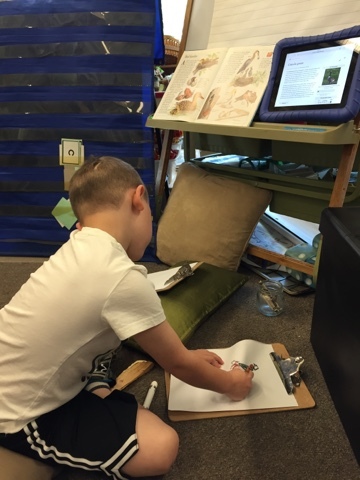 ...each pair spent time researching, writing, and drawing their living thing together. 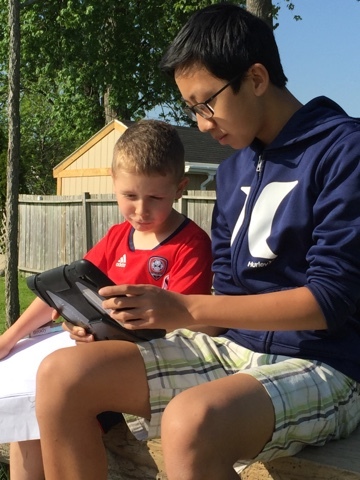 This was an excellent chance for our grade 8 students to mentor our children in the use of technology for the purposes of research. We are looking forward to compiling their information into a final, finished product to share with our greater community soon! 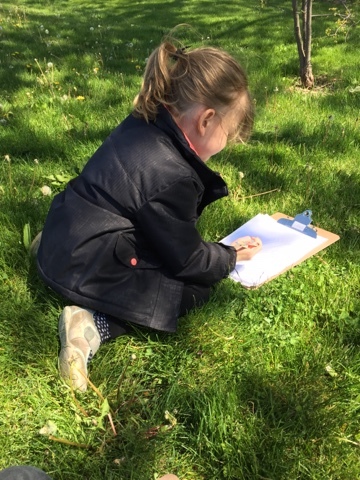 As a culminating activity we asked the children to take the pictures they had drawn and find places in our outdoor space where the living thing was either observed to be or might be found. This was an excellent way to assess if the children remembered the information they had researched about their chosen living thing, and also to see if they could apply this information to a new context. 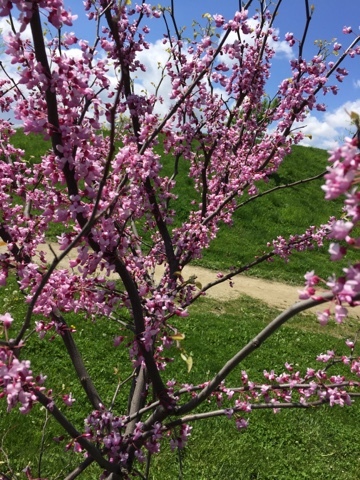 With the support of a parent volunteer, the children found the right spot and with a little bit of creativity, were assisted in order to take a photo of their living thing in its habitat.